The guide to Vermont's independent country stores has rolled off The History Press. 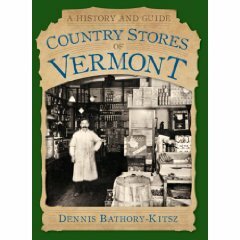 Country Stores of Vermont: A History and Guide was written by the Vermont Alliance of Independent Country Stores executive director Dennis Bathory-Kitsz. The 256-page guide covers the history of country stores and includes ten tours with driving directions and maps, with sixty modern and historical photos. If you're visiting Vermont, this book is a must-have! The book is available at Amazon.com or any of our country stores or local bookshops. There is a Vermont Public Radio audio postcard about it and also it was the cover story on Seven Days, our premiere Vermont arts and enterntainment newspaper. Writes the publisher, The History Press: Visiting a country store in Vermont is a unique adventure, since each carries its own particular stock of special wares and memorable characters. Author Dennis Bathory-Kitsz takes readers across the state to the places where locals have been keeping their house keys behind the counter and solving the world’s problems on the front stoop for over two hundred years.